Tuesday I wrote about Zopa's plans for Zopa listings. 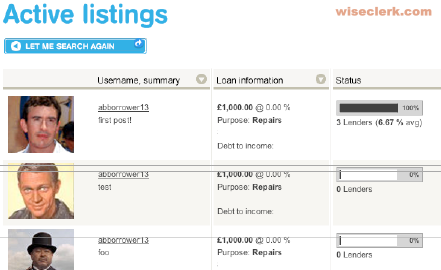 Now a preview of how the new Zopa listings will look is available. With this feature Zopa will take the step from anonymous borrowers to a more personal look with borrower listings and profiles. 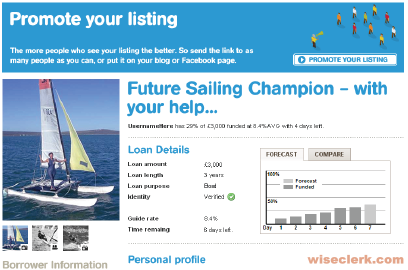 To create a listing borrowers will have a credit grade of at least C.
The 8 page preview description gives more example screens of Zopa listings, which Zopa says it will introduce within the next months. Lender feedback (which is limited so far) has been mixed. With this changes, should the Prosper & Zopa merger that Jeff & Heather wish (it is really only wishful thinking!) ever happen, then at least the layout question seems decided now.